The 2011 growing season at Kamen Estate Vineyard was marked by even, cool temperatures with only one heat spike over the July 4th holiday. Because of the cool spring, we experienced a later than usual bud break. A vigorous canopy required constant manipulation to ensure the dappled sunlight, which is instrumental in producing mature, ripe fruit. The long, cool season provided ample hang time resulting in soft, yet firm tannins, great aromatics and abundantly fresh acidity. The harvest delivered ripe, voluptuous and structured fruit. 2011 was amongst the most challenging vintages in Northern California. 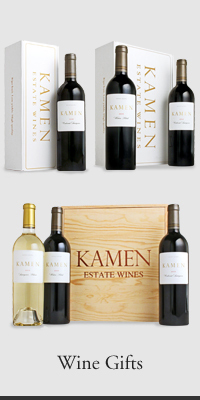 The ridiculously low yields at Kamen Estate produced an aromatic powerhouse. This wine exudes aromas of sun-baked volcanic rock, black raspberry turnover, candied black cherry, espresso bean, graphite, black cardamom, hints of suede and fresh purple flowers. The palate is focused, seamless and elegant. Rich with flavors of black China tea, black cherries, currants, dark cocoa powder and rock. This wine will age gracefully over the next 15 years.